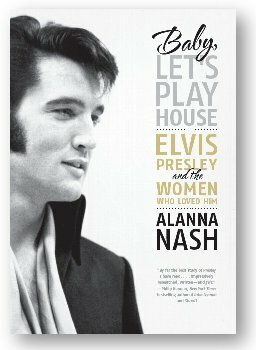 The Elvis Presley Scrapbook is 'very proud' to recommend (and be associated with) 'Baby Let's Play House' by Alanna Nash. Read more courtesy of The Elvis Information Network. Baby, Let's Play House - read what others are saying (and downloads) by clicking HERE. 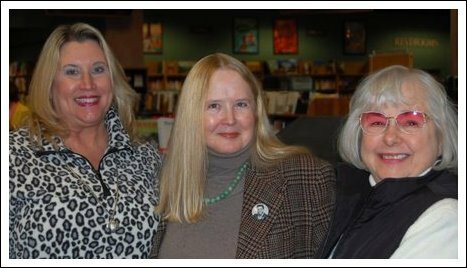 The Author in Memphis Tennessee with two of Elvis's girlfriends. Image copyright (2010) Jim Smith (with thanks to Barbara Hearn) and used here by kind permission. 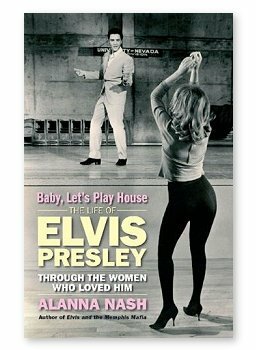 Most Elvis fans are familiar with his appearance on "I've Got A Secret" in the late 1950's and the recordings he made while Elvis was away in the service titled 'Who's That Kickin' My Dog Around'/'The Billy Goat' Song coupled with 'Swingin' In The Orchard', but how much more is there to know ? On a recent visit to Louisville, Kentucky I was very lucky to spend some time With Alanna Nash, author and biographer of Elvis' manager Colonel Tom Parker. As a native of Louisville she had already started to delve into Jessie D. Presley herself, but now together with Alanna, myself and my wife would have a very interesting couple of days ahead. Born in 1896 in East Tupelo, Mississippi Jesse became the so called 'bad apple' of his family.... (if what we are told is to be believed). His Brother Noah eventually became the Mayor of Tupelo yet in April 1936 it was Jessie who was the one to warn the worshipers at the Baptist Church of the on coming storm that turned out to be the Tupelo tornado. The tornado caused massive death and destruction in the area and he was the one who signaled the family to hurry out of the church to safety and it was then that his Brother Noah drove the family (Vernon, Gladys, Elvis, Minnie Mae and the children) to the family home in a school bus where the men then braced themselves up to the walls against the storm. 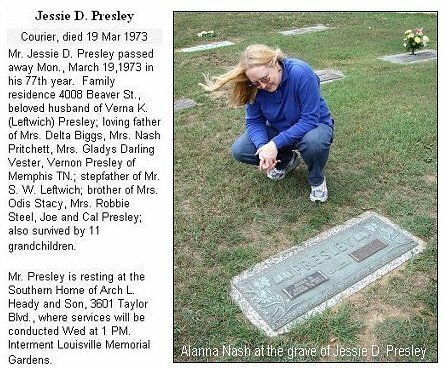 According to various Presley family related stories and other publications Jesse had a 'mean as hell' reputation. He liked to drink, dress sharp and womanize.... then maybe this was a Presley 'male' family trait as apart from the drinking doesn't the sharp dressing and womanizing sound familiar? That aside it is unfair to judge anyone from only one side of a story yet even after her divorce from him Minnie Mae still called him a S.O.B. to anyone who may ask about him. "The only times I heard Elvis speak of his Grandfather was in terms about how much his Grandmother hated him. It seems he just left and abandoned her many years ago. He also said that he thought he was a ladies man and was a dandy in his dressing. I never met his Grandfather and I don't recall him ever being at Graceland." Jesse might well have had a reputation and he might even have recognized it within himself but when his own Son Vernon (Elvis' Father) was aged 15 he was kicked out of the house and sent to a relatives farm in Pickets, Mississippi for a year to straighten himself out. This might seem harsh but then again you could argue the point that this is the action of a Father who cared enough to try and rectify his Sons attitude and problems. It is also said that Jesse was controlling over Minnie Mae and when they had visitors to the house he instructed her on how many biscuits and cheese slices to hand out to their guests. Again you could argue that as times were hard he was just being careful and thrifty. The house in which Elvis was born was built with help and although Vernon and Vester are commonly reported to have built the two room shack (the hammer they used is on display in the Tupelo Birthplace Elvis museum - see image right), Jesse and his Brothers also had a hand in helping build the home on Old Saltillo Road. In a 1977 interview given by Vernon he states his father was present at the birth of Elvis along with Minnie Mae, the midwife, Dr Hunt and a family friend named Edna Robinson. Elvis' Cousin Billy Smith relates a story that Jesse was drunk at the scene and was 'coochy cooing' the stillborn twin until Vernon shouted at his Father exclaiming that the baby was dead ! Other than Billy Smith himself I cannot determine a source for this story but I can take an educated guess. Either way the family still thought enough of their Father to name the dead twin Jesse. Most Elvis fans are aware of the time Vernon spent in prison for forging (or changing) a cheque from Orville S. Bean relating to the sale of a hog, strange then you might think that Jesse filed bail for Travis Smith (another family member) and not his own Son Vernon. Maybe it was to teach him a lesson but could this not be the action of a Father protecting the rest of his family on a larger scale ? At the time Jesse was farming on land owned by Orville S. Bean and Bean was Jesse's landlord also, to rock the boat any further by filing bond for Vernon might just have put the whole family out on a larger scale..... draw your own conclusions. In the mid 1940's aged around 50 he took off and filed for divorce from Minnie Mae, (anyone heard any of those stories about how hard and mean Grandma could be?) she protested that he hadn't provided for his family in over a year but the divorce was granted none the less. Jesse made his way to Louisville Kentucky and although a carpenter by trade he was a night watchman at the local Pepsi-Cola plant. His association with his blood line family didn't end there though. On Sunday 25th November 1956 Elvis played two shows (2pm/8pm) at The Jefferson County Armory in Louisville.On Monday the 26th after picking up his cheque Elvis paid a visit to his Grandfather at 4008 Beaver St and he didn't arrive empty handed. 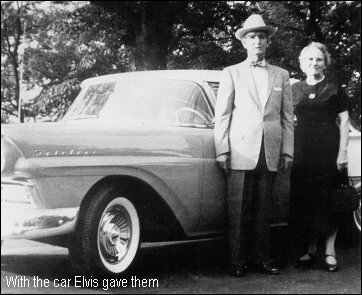 Elvis brought with him what is reportedly the very first car he ever gave away, a brand new 1957 Ford Fairlane with a new TV set in the trunk and handed over $100 to Vera Presley (nee Leftwich) his step Grandmother. Presley Leaves New Auto, TV Set , Cash for Kin Here. Elvis' Grandfather was rightly proud of his Grandson and kept a collection of scrapbooks about him. 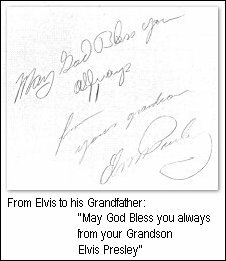 Elvis even wrote to his Grandfather (writing was a rare thing for him to do) while he was away in the army and he even sent him Christmas cards too.These items were auctioned in 1995 by Butterfield and Butterfield as part of the Elvis Presley Museum collection. 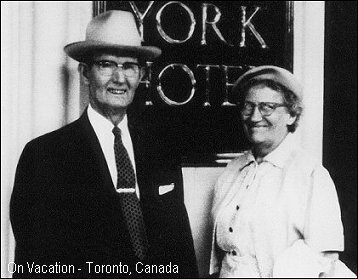 Vernon also kept in contact with his Father, actually visiting him in Kentucky in July 1959 to introduce him to Dee Stanley.... hard to think then that this was the action of a Son who had no respect for his Father? There are also pictures (allegedly) of Vera Presley (credited to Maria Columbus) on the set of Follow That Dream in the book 'From Memphis To Hollywood' by Alan Fortas, it would therefore not be hard to presume that she would be there with her Husband Jesse. There are rumors of family visits from Kentucky to Graceland and it would be safe to assume that the families did indeed keep in touch more than previously reported. On the 7th November 1971 Elvis played Louisville Kentucky again and at Freedom Hall he introduced his Grandfather (who was in the audience) to the crowd. I have come to the conclusion that Elvis' Grandfather Jesse D. Presley has been much maligned and mis-represented. It seems to me that Minnie Mae continued to hate him with avengence even after their separation and divorce, I personally think that he deserves a re-evaluation within the 'Presley' world.From what I have been able to determine thus far Jesse never asked Elvis or the family for anything after leaving and he spent the rest of his life making his own way in the world with Vera and for that at least his deserves some respect. Jesse D. Presley died on Monday 19th March 1973 aged 77 of a heart attack and for obvious reasons Elvis did not attend his funeral. He now lays at rest with his wife Vera in Louisville Memorial Gardens, Kentucky, USA. EIN - Roy it is a pleasure to talk once again. Firstly can you tell us how you first became involved as a Tupelo historian - and whether the Elvis connection was an all-important factor? Roy: After seeing the TV series Roots in 1977, I decided to research my own family. Suddenly history was interesting. It was my people who were affected by war, famine, blight and so on. I realized that I was who I was and lived where I did simply because of the fortunes and mis-fortunes of my ancestors. I began publishing genealogical records of Lee and Itawamba Counties in Mississippi. These were the counties my family settled in when they came to Mississippi. Genealogy and history go hand in hand. One compliments the other. Although I grew up in East Tupelo, went to Lawhon School, and had some of the same teachers as Elvis, I really was not a fan. I saw all of his movies, but then I saw all movies at the local Lyric because my great aunt Ica worked there and one of her perks was free tickets. I was born too late to be present for his groundbreaking 1950's era. EIN - When did you first get interested in Elvis? Roy: When Elaine Dundy came to Tupelo in 1981 to research Elvis & Gladys, she asked the local library if they could suggest a local genealogist/historian to assist her in the research. We were introduced and were off to the races. Elaine was very interested in everything Elvis, the more we researched, the more I liked the guy and the more I discovered how similar our childhoods were. EIN - Sometimes 'locals' are not so interested in hometown characters. Do you think this is true of Tupelo and Elvis - and have you seen it change over the years? Roy: Tupelo was not proud of Elvis until after his death. I think many of the old timers just could not grasp what they considered to be "poor white trash" making something out of themselves - especially something as big as Elvis became. After his death fans started sending money into the city to do something in memory of Elvis. This money was used to build the Chapel at the birthplace, but more importantly, it awakened something in the city fathers - Elvis was a tourist draw. Now what started as a mere method to make money has become something more and better. As with anyone touched by Elvis, even Tupelo and its residents came to appreciate him and be proud of him. At least most of the old timers did. EIN - With Elvis' Birthplace being officially opened in 1971, did you see the Elvis interest in Tupelo grow at this point? Roy: The birthplace was falling down and in need of much repair work. The East Tupelo Garden Club (which consisted of matronly women and retired school teachers) ask the city if they could take on the house as a club project. The city agreed and these dear little old ladies saved the house from being forever beyond repair. EIN - I know you were majorly involved in the recent 2006 upgrade of the Elvis Tupelo Museum. Were you involved in the Museum previously - and how did your input change the new layout? Roy: I was not previously involved. I guess I had to prove myself. With Jim Palmer's and my film and the recreation of the 56 concert, I think the leaders of the birthplace saw I knew my subject well, had an honest appreciation for the man and his talent and wanted to preserve his story "warts and all" as I say. To take the warts away is to take away the essence of Elvis. Elvis became this great music icon in spite of the warts in his life. For me, his story of triumph in spite of the pitfalls make him all the more inspirational. EIN - It must have been disheartening for you when Janelle McComb passed way last year. How close was your relationship with her - have you always known her? Roy: I have known Janelle since the mid 70's, we were acquainted but did not have a lot of contact with one another. Janelle, in her own way, did her best to preserve Elvis' story. I admire her for that simply because she did during a time that it was not a popular item on the agenda. Her tenacity certainly preserved many things for future generations. EIN - Who do you think are the most important Elvis Tupeloans who you have met over the years? I know you were close to Elvis' aunt Lillian..
Roy: Lillian was definitely one of my favorites. She told Elaine and me things about the family we could have never learned without her help. She and Gladys had worked with my father in the shirt factory and I think that relationship is one reason she was so willing to share stories with us. EIN - What about people like Brother Frank Smith, he must have told you some fascinating stories? Roy: Brother Frank is perhaps the single most important Tupelo influence on Elvis. At a very early age he was encouraging his singing and guitar playing. It was Bro. Frank who taught Elvis, and all the other kids of the Assembly of God Church in E. Tupelo, Old Shep, but Elvis embraced the song and made it his. EIN - It must have been unbelievable for Brother Frank to see the Elvis phenomenon happen! What on earth did he thing about Elvis being described by the media as the Devil incarnate? 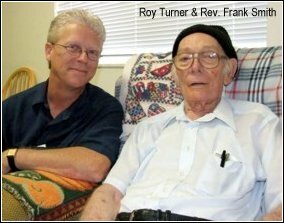 Roy: Brother Frank never thought of Elvis as evil, he knew too well how they all cut up in church service when the spirit came upon them. When Elaine and I went to a little church in the Juda Community in Pontotoc County, MS, it was at the suggestion of Bro. Frank's wife Corrine. Corrine said if we wanted to see religion the way Elvis experienced it, we would have to go to the county - the city churches had become to sophisticated. After about three hours of the service in hot, Mississippi, humid, July weather in a little church with ceiling fans whirling and windows opened, we left. The service continued until way into the night. The people had danced around the entire sanctuary, shouting, writhing, fainting, wailing to exhaustion. Elaine remarked: I feel like I have been to an Elvis concert. Brother Frank's only comment of remorse was that he had a thought to go talk to Elvis about his spirituality about a month before his death. Bro. Frank regretted not following up on what he considered a message from God that Elvis needed to talk. EIN - Charlie Boren was the first announcer on Tupelo's first radio station WELO. What's the connection between him and Elvis singing 'Old Shep'? Roy: Elvis hung around the door at WELO so much that they all knew him by name. Charlie encouraged Elvis to sing other songs - even forbade him from singing Old Shep at the 1945 fair contest. Of course we all know Elvis replied "yes sir" and went on about his business as usual and sang the song at the fair. Charlie and Elvis were both good sports. Years later, Elvis remembered the incident and called Charlie to rub it in that he had made a record of Old Shep and sold a million copies. I love Elvis' humor and good natured getting even with the boys back home. EIN - In all how many "Elvis Tupeloans" or Elvis' friends from school have you managed to track down or interview over the years? What about the Tupelo Elvis Sweethearts? Roy: Goodness. I can't name them all! When Elaine and I were doing E & G, I contacted most of the kids that would have been in his graduating class had he remained in Tupelo, but that was 27 years ago. Some of the more memorable ones were Gladys' cousin Corrinne Tate, who she and Elvis lived with in South Tupelo while Vernon was in Parchman. Ernest Bowen of WELO and Jean Boren (Charlie's widow) have great stories. Terry Wood, Sam Bell (his best friend on N. Green St.) Bo McClinto - who took him to Shake Rag. Bro Frank was always humble and willing to share with me and all the fans. The Tupelo Elvis Sweethearts were a wonderful microcosm of 1956 teenagers looney over Elvis. Sara Patterson had one of the best stories of her meeting him at the 56 fair. EIN - You are credited in Peter Guralnick's marvellous 'Last Train To Memphis' biography. 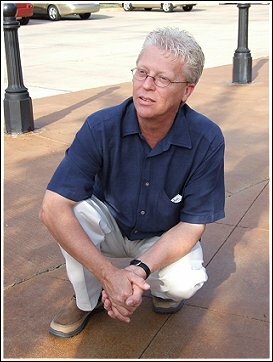 Do you think Guralnick correctly captured the life of Elvis In Tupelo? Roy: I do. Peter, as he states in the acknowledgments, built on Elaine's research. He has some different interpretations, but either could be right on in those areas where we can only examine the facts that can be found and make intelligent conclusions. EIN - Many fans ask what happened to the 'Elvis Presley Youth Recreation Centre' which the proceeds of his 1957 Tupelo show were supposed to go to. There was a park created around 1960 I believe, but did the possible $20,000 (a lot of money in its time) that came out of the benefit ever get accounted for? EIN - The black suburb of Shake Rag always gets named as a place that Elvis would have hung out and been influenced. However as Elvis was only 13 when he left Tupelo it seems a young age to be hanging around a poor area of town. What is your opinion? Roy: I know he did go to Shake Rag with Bo McClinton. And while there he met Muddy Waters and many other blues performers. The people in Shake Rag were no poorer than the Presley family - they were just a different color. The sounds drew Elvis like a magnet and the interesting part is he was always welcome. It was also an area of a lot of sinful things like gambling and prostitution and booze. Elvis wasn't the only white boy or man for that matter going into Shake Rag. He was just the only one interested in the music. EIN - Did 'Shake Rag' exist in the same way when you were growing up or had it changed? Did you visit it? Is the area still discernible? Roy: It did exist but I was never brave enough to venture into the community like Elvis did. It was torn down during the early 70's and our colosseum sits on part of the site now. I think it remained a pretty hopping place until its end. EIN - Even when Elvis lived in Memphis, he was known for showing friends around his Tupelo roots. Do you know if Elvis did return there in his later years to look around - and did you ever see Elvis in Tupelo? EIN - Can you describe what it was like being so close at the Mid-South Colosseum concert? Do you listen to the FTD release and relive it all? Do you even think that recordings of Elvis can do justice to his astounding presence? Did you not get the chance to see his later concerts in Memphis, or did everyone think that he would always be coming back again? Roy: We certainly thought Elvis was going to be here for a while, so there was no rush. As I said, we had front row, center stage seats (my cousin worked the box office and there were a lot of cousins on the front row). He was remarkable. His stage presence was overpowering. I think even if you did not like the man or his music, you would leave a live performance as a believer and fan. I made the comment that it was a little embarrassing that he stared directly as me during the whole concert. There were not that many men on the front row. All of my cousins began, "Oh no. He was starring at me." And over the years I have heard many people sitting all over the auditorium say it seemed he was looking right at them while he sang. It must have been a gift for all of us to feel he was looking at only you. EIN - Elaine Dundy's fantastically detailed 'Elvis And Gladys' owed an enormous amount to your research. Was it fun working with Elaine on that book? Roy: It was the greatest summer of my life to that date. I always had stars in my eyes and loved old Hollywood and the studio system – the whole pie. Elaine was very glamorous. She knew everybody I had admired as a kid: Vivian Leigh, Olivier, Orson Wells, and had met and threw a party for my childhood passion, Marilyn Monroe. I learned so much from her – how to research a biography. How to interview. And most of all I made a friend. That friendship lasted for 27 years. Until her recent death. When she left I told her I was sad because I knew I would never see her again. And she responded "oh yes you will. We will work together again." And of course we did. I miss her greatly. We talked weekly and sometimes three times a week or three times a day. I owe her so much. EIN - I think 'Elvis And Gladys' was the first book that really opened fans eyes not only to the poverty of where Elvis' family came from but also the importance of Tupelo in his life. How do you think Elvis' life would have differed had he be born and grew up In Memphis instead? Would the Elvis Presley phenomenon still have happened in the same way? Roy: Good question. I just don’t know. He certainly would have been a different person. Poverty in E. Tupelo was not like poverty in a large city. The community supported one another. If one person had a Kodak camera, they all had access to a Kodak camera. A radio, sewing machine and so on. The constant encouragement Elvis received in East Tupelo was important to him. I am not so sure he would have received the same in Memphis, because when he got to Tupelo proper, the kids at Milam treated him differently from the kids at Lawhon. No doubt he would have become a sensational performer, but the sweet, humble, honest Elvis we all knew and loved would have been a different man had he had a different upbringing in different surroundings. EIN - As most Elvis fans would know Elaine Dundy recently died aged 81. Reading her biography she had the most amazing life. I know that you and her remained good friends. Is there any story you'd like to tell us about Elaine? Roy: She was a very giving person. Giving of herself. I think that was an unusual trait for someone of her statue. One of her caregivers was Asian and studying to become a nurse. She spoke very fragmented English. Elaine took it upon herself to teach her English and enrich her vocabulary. This was the hired help. That was Elaine. She once told me she had no class – she assumed the class of the person she was with. And that trait always made others feel comfortable. EIN - The MRS book 'Tupelo's Own; Elvis Presley' is your most recent publication. How long did you work on that and did you make any more important discoveries while researching it? Roy: I spent about 6 months writing and re-writing as Joseph made suggestions. It was the culmination of the things I had learned with Elaine plus the things Jim Palmer and I discovered while shooting Homecoming. The most important discovery was the interview with Sam Bell and Bo McClinton. Elvis’ two black childhood friends. Bo took Elvis into Shake Rag to hear the blues and meet Muddy Waters. We never knew he actually ventured into Shake Rag much less became a regular visitor. EIN - I believe that you were the one who tracked down the original print of the 1945 Talent Show - where Elvis came fifth. That's an amazing find after all these years! Roy: Yes. I was so excited. I had heard for years that Charlie Boren’s widow, Jean had the photo. When she pulled it out my eyes popped out of the sockets. After the interview, I said, "I know the answer to this question, but I am going to ask anyway. Is there any way you would let me take this photo and scan it into my computer?" She looked at me rather matter of factly and said, "I have never let that picture out of my site. (pause). . But, I am going to let you take it because you look honest." Wow! And I did and returned it two days later. EIN - Were you involved in tracking down a lot of the previously unreleased photos in the book, some of which were sensational? Roy: You know Elaine coined the phrase GODSHOT. She said she would be at the right place at the right time and something would just fall into her lap. The Elvis Homecoming story was my Godshot. Jim and I started because I had talked about doing it for a decade. Jim said quit talking and do it. Little did we know the 50th anniversary was just around the bend. I had acquired the good faith of several people who had Elvis stories over the years and photos. They were more than happy to let me use them. Godshots! What else can I say. EIN - Several fans have asked me if it was actually you who tracked down the amazing unreleased Fox News movie footage of Elvis live on stage that day? Roy: I had inquired of Peter Bregman at Fox Movietown Division about the outtakes. He sent me a screener of all the shots made that day. Then Joseph followed up on it. EIN - What about the snippet of the Evening Show footage, do you think there could be any more surprises that could be discovered? Roy: There have to be photos and footage in local people’s attics. Also when you look at the crowd shots, there are a lot of camera out there and some are movie cameras. Yes I think more will be discovered in time. EIN - What did you think of the final MRS Tupelo package, including the DVD? Roy: I thought is was an awesome job, beautifully packaged, first Class as all of Joseph’s work is. I was totally pleased to be a part of it. EIN - I'm not sure if you know of the debate surrounding the fact that MRS's Jo Pirzada used some unacknowledged photos in the 'Tupelo's Own' book, some of which had definitely been scanned from Ernst Jorgensen's 'Flashback' book. Do you know anything about this debate? Roy: I only know about what I contributed. I know he had several sources. I was only one of them. EIN - When it comes down to it 'Tupelo's Own; Elvis Presley' book was so popular with fans that I believe it has sold out. Do you know if this is true? Roy: It did sell out. Joseph gave me permission to have the book reprinted in America. But I have not been able to accomplish it to date. Hopefully someday. EIN - Can you tell us about your documentary 'Homecoming: Tupelo Welcomes Elvis', how long did you work on it before its 2006 debut? Roy: Jim and I began actual filming in August 2004. 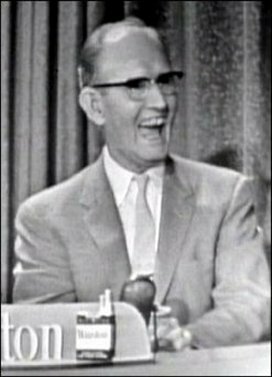 The first interviews we shot were Jack Cristil and Bro. Frank Smith. Then my mother passed away unexpectedly and I did not resume work on it until Jan of 2005. Jim was editing and adding music two days before the premiere. EIN - As a documentary how does it compare to the MRS Tupelo book and DVD? Roy: The Tupelo’s Own book is a compliment to the film. There is more detail in the film about the two fair appearances – 1945 and 1956 – and the chance to hear the people speak in their own voice. So many of them were unique, like Jean Boren and Judy Hopper. EIN - What was it like being there at the 2006 Tupelo Festival seeing shown for the first time? Roy: Jim and I were on cloud nine. To see your own creation on a big screen and people applauding your work is an awesome experience I will never forget. You think you have created something good, something the fans will like and appreciate, but you never know. Hearing their applause was reassurance we had done a good job and had done Elvis justice. EIN - And how does the original version differ from this newly edited 2008 version? Roy: They are really two different stories. Ours focused on two days in the life of Elvis and how they were intertwined. Michael Rose’s film delves into Elvis’ childhood, giving the audience the chance to experience Elvis growing up in Tupelo and ends with his homecoming concert. The fulfilment of a dream. EIN - It's great that the new Return To Tupelo documentary will get out to such a wide audience. It's such an historical moment that the 'general public' often don't know much about. Are there any particular interviews in this new 2008 documentary that didn't feature in your original film? Roy: Yes there are several. The most interesting to me is to be able to hear the voices of Mr. Bobo at Tupelo Hardware recall the day Elvis and Gladys walked into the store for a rifle and walked away with the guitar that changed musical history. If Elvis had gotten the gun that day... Another is Elvis' 6th grade teacher, Mrs. Dewey Camp. 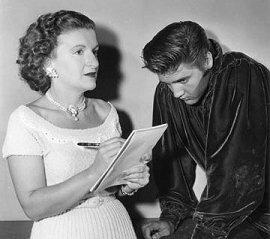 Mrs. Camp recalls Elvis sitting in the class at the back of the room, rather timid, until the day she asked, "can any of you children sing?" His little hand flew up into the air... For us fans to hear the stories in their own words and voice is great. Jim and I had the interviews for our film, but could not work them into our format. Michael has done a great job with them. They were interviewed not long after Elvis' death by Gwen Posey. Thank God for her foresight. 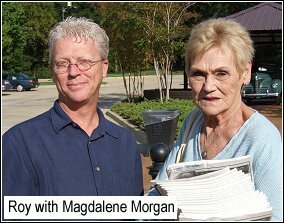 Also, Mary Magdaline Morgan - Elvis' first girlfriend at Lawhon - is interviewed. ... And Elaine Dundy gave her last on camera interview for the film. I hope everyone will be as pleased with the end result as I am. EIN - How did the premiere go last week at the 2008 Tupelo Film Festival? Were any of Elvis' original friends able to be there and what did they think? Roy: Michael’s film premiered at the festival last week. 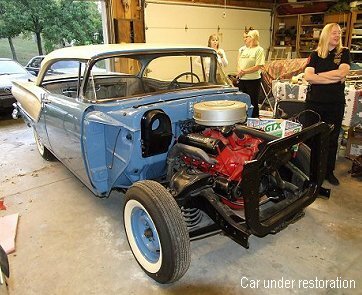 It was a small crowd – maybe 100 – the people attending were pleased with the end result. Two old Tupelo friends were present – Guy Harris and Elvis’ old sweetheart, Mary Magdaline Morgan. It meant a lot that they were pleased with the film. EIN - Do you know when it will be shown on TV? Roy: I am told this year, but no date. I am betting on August. EIN - This year's Elvis Tupelo Festival is about to start. Are you involved in it this year? And what excitements can fans expect? Roy: I am helping to oversee the tribute artist competition at the Lyric Theatre. We will also be showing scenes from our original film during the competition on Friday. EIN: Anything you want to add? Roy: I am thankful that Elvis was born in Tupelo and that Elaine Dundy came to town to learn all about him. And that I was picked up for that journey. Elvis has added so many good things to my life. Another Godshot! EIN - I can't wait to see the finished documentary on TV, that will be a real buzz. Thanks so much for your time, I know that you are a busy, busy man! Roy: Thanks Piers. I hope it goes well. 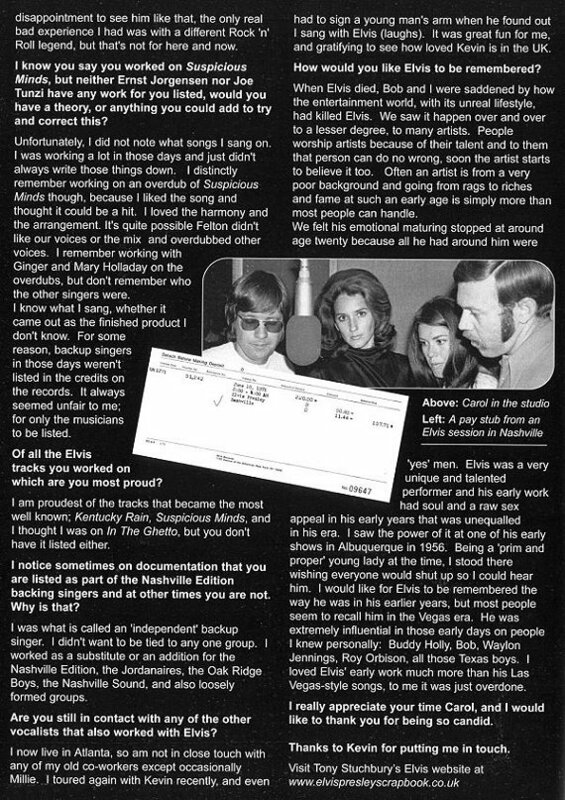 Interview by Piers Beagley of the Elvis Information Network. First published in May 2008 and used here by kind permission. A Tribute with a Twist ! 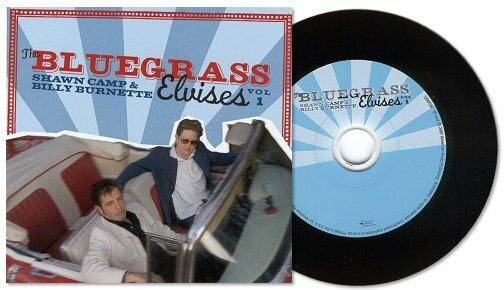 I've always found bluegrass music to be an acquired taste but maybe that's 'just because' I'm an Englishman, who knows? Here though is a most sincere and honest Elvis tribute album with a twist and.................... IT WORKS ! If you can spare just thirty five minutes of your time I'm sure you'll find these tracks (made world famous by Elvis) delivered in a bluegrass style quite refreshing when compared to the durge of other 'tacky' tributes you get 'popping up' around this anniversary time of year. For more detailed information (and sleeve notes written by renowned author Alanna Nash) download the PDF file. Trude Forsher was a stay-at-home housewife with aspirations to become a writer. She convinced family friends back in June of 1956 to introduce her to Elvis and the Colonel in the hopes of writing an article. Elvis and The Colonel took a liking to her and when negotiations finished to begin shooting Elvis first film, then titled the Reno Brothers, they called Trude and asked her to come on as Elvis' private secretary. Not wanting to let go of her writing ambitions, she kept daily notes in a diary about life with Elvis and the Colonel. She also saved hundreds of items related to her years with Elvis which are included in the book. 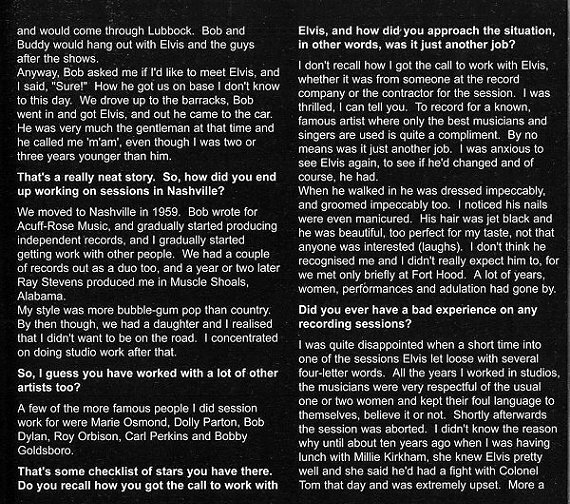 The Love Me Tender Years Diary gives a true 'behind the scenes' look at the making of the legend - Elvis Presley. Before we get down to the Don Davis Elvis interview I have to ask, this isn't the first time you have helped with an Elvis release is it? No it's not, apparently there are some masters missing for some of the Sun releases. What I had at the time and I've since sold them, was a set of five promotional copies of the Elvis Sun 45's which were some of the first ones pressed from the stampers. They had just a bit better sound than anything that BMG had over there as far as sound quality from a third or fourth generation master. They used some of them on the ELVIS AT SUN release. It sounded good, they sent me a copy and gave me a credit on it. I just made them CD transfers here off of the 45's that I had and sent them over, I put it in the machine and it sounded really good. OK, down to business, what can you tell us about the Don Davis acetate and how long have you had this little gem? I don't really remember, I've had it for a long time, it was sometime in the 80's. I was going around in the late 70's and all the way through the 80's, going all over the USA to different radio stations and buying up as many piles of old records, 45's and 78's mainly, that I could find. 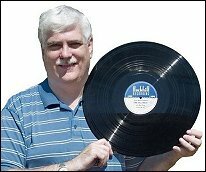 I would always, when I was in these stations, look through anything that was unusual whether they were acetates, transcriptions or anything that was different from your normally commercially released records. I went through all of those. This was probably the most unusual thing I found on Elvis because when I got it I mentioned it to a number of people and nobody had ever heard of it, nobody knew anything about it and it wasn't documented anywhere. On the label it says TIMEHILL FROLIC, that's the name of the radio show....I have it here wait a second. Ok, what this says is A ROCKHILL RECORDING. Rockhill was a radio transcription company out of New York located at 18 East 50th Street, New York City. They mainly did recordings of live radio programmes for people who wanted them for reference purposes but they would also do pressings of things for syndication. 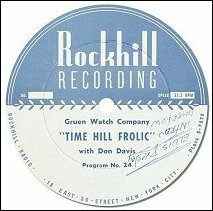 What this says on the label is A ROCKHILL RECORDING, underneath Gruen Watch Company and underneath that it says TIMEHILL FROLIC with Don Davis (the host) and continuing underneath that PROGRAMME 24. That's all that is printed on the label other than the address for the company. What caught my eye when I was going through these at the station was the disc jockey or whoever owned the station had written in pen upside down "ELVIS PRESLEY INTRO AND INTERVIEW". I remember seeing that and thinking what is this, I had never heard of TIMEHILL FROLIC in relation to Elvis Presley? Which radio station were you at? I was buying a whole bunch of transcriptions from this station along with some records and there were so many of them (stations visited) that I can't remember, it was somewhere in the South is all I know. I tossed this on the pile without hearing it just thinking maybe it will be something interesting. When I got it home I left it laying around my office for a long time before I actually played it but when I eventually played it I was struck by how interesting it really was. Then I started asking people about it and everyone I asked said no, I've never heard of this, don't know anything about it. I didn't really want to keep it because I'm a blues collector, I don't really collect Elvis although I like him but I don't feel the need to keep everything in the world I find so I put it up for sale in 1990 or 91. I advertised it I believe in GOLDMINE at the time and I had a $3000.00 opening bid. I didn't get any bids but I figured if it's that unusual and rare then $3000.00 shouldn't be too much to ask. In the world of rare records, and something on Elvis that no one has heard or ever seen, I just didn't think $3000.00 was an outrageous opening bid but nevertheless I didn't get ANY bids so I just put the record away in my office and forgot about it. Then about five or six years ago, maybe a little bit longer than that, I got a call from Jerry Osborne who was doing a book called "Elvis In His Own Words". He called and said, "You know you had this advertisement a few years back with this Elvis Presley interview, would you mind checking and giving me some information on that because I can't find it documented anywhere and maybe it's something I can use for the book I'm working on." I asked if he would like to hear some of it and played a little to him over the phone. He was like, "WOW, this would be great, would you mind transcribing it for use in the book?" I agreed to do it for him and allowed him to print it in the book and then I put it away and forgot about it again. 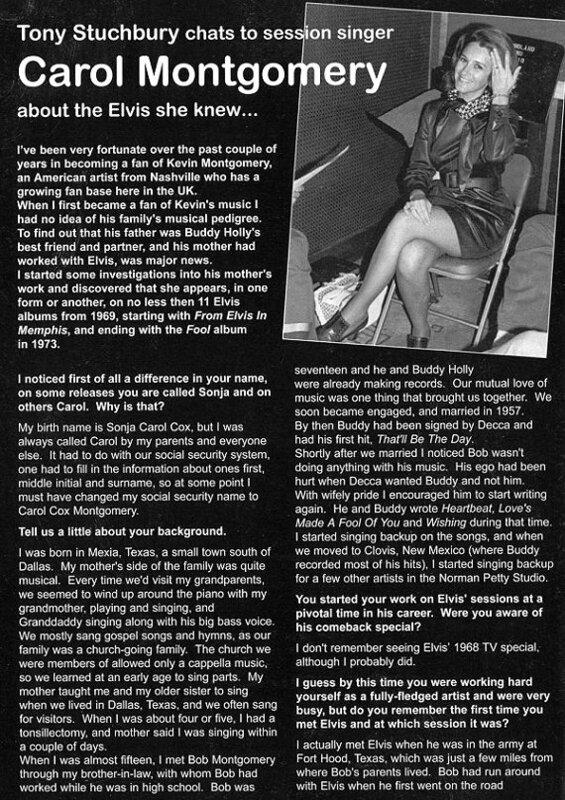 Then about six or eight months ago Kevan (Budd) calls me and he says, "You know I got this book that was written by Jerry Osborne and it's got this Elvis Presley interview in there and he gives credit to you, do you still have the original recording of that?" and I said I did. He said, "Well can we negotiate something so we can put that out on a CD?" So I negotiated a price with them which they paid and of course now it's on the CD, that's how it all came about. It's been one of those things that has come and gone, and yet the original record is still here. How do you feel about the release? I figured once it was re-issued on CD one of two things would happen -- either the original would be de-valued because now people could hear it and it wouldn't be any big deal anymore or maybe there would be more interest in the original record because it is documented that it does exist and it is something of historical importance to the Elvis fans. I took the chance. Maybe it will help me to finally sell the record because what I mainly collect and what I mainly do are the very rare early blues records from the 20's and 30's. Thanks for the fascinating insight into the story and I appreciate your generosity with your time. Well you're very kind and thanks for taking the time to talk to me.